To a robot, gears are everything. High-quality gears mean that robotic limbs start and stop smoothly, and operate without jerking or shaking. Low-quality gears are usually a recipe for disaster. That's why Nasa is pursuing an exotic material to make the gears that'll drive the next generation of robotic astronauts. Metallic glass is a specially-crafted alloy that's made by heating up a metal until it melts and then cooling it extremely rapidly to trap its "liquid" structure in place. The result is a material that's extremely easy to shape into whatever parts you need, but has a much higher strength and wear-resistance than alternatives like plastic. Most importantly for Nasa, metallic glasses don't get brittle when exposed to low temperatures. For robots sent to frozen planets in our outer solar-system, that's extremely useful. Past generations of robotic explorers, like Curiosity, use lubricant in their gearboxes that must be heated before use - a process that requires precious power. 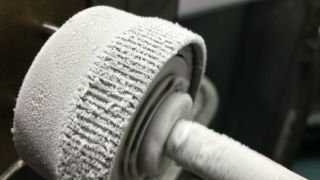 In testing of metallic glass gears however, Nasa engineers showed that they demonstrate strong torque and smooth turning with no lubricant at all, even at temperatures as low as -200C. "Being able to operate gears at the low temperature of icy moons, like Europa, is a potential game changer for scientists," said R Peter Dillon, a Nasa technologist. "Power no longer needs to be siphoned away from the science instruments for heating gearbox lubricant, which preserves precious battery power." What's more, it could have advantages on Earth too. It turns out that a complex, expensive robotics component called a "strain wave gear" can be made far more simply and cheaply, without sacrificing performance, by using metallic glass. "Mass producing strain wave gears using metallic glass may have a major impact on the consumer robotics market," said Douglas Hofmann, who led the research. "This is especially true for humanoid robots, where gears in the joints can be very expensive but are required to prevent shaking arms." "The performance at low temperatures for JPL spacecraft and rovers seems to be a happy added benefit." Details of the gears produced by JPL can be found in two papers published in Advanced Engineering Materials and Scientific Reports.